My knitting kind of fizzled out over the last few weeks, but I'm hoping that will soon change. I only wanted to work on simple things, like my Lacy Baktus shown above. I made quite a few mistakes that resulted in unintentional lumps and bumps, but that's okay, I think I can live with it. I'm itching to get back to my Ishbel. The stockinette portion is finished and the lacy section has begun. Every time I sit down to work on it I remember it's time to add a lifeline, and then my eyes glaze over and I tuck it away for "next time." I think "next time" might be now. 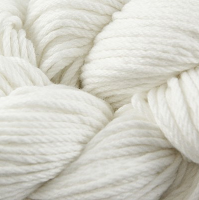 I received a newsletter from my LYS this morning and was excited to learn they are carrying new yarn in my favorite blend: pima cotton and silk. It is called Mirasol Wach'i and comes in eight colors. Mirasol is also offering a little book of Wach'i garments for women and girls. I have a twenty dollar gift certificate for this particular LYS, so my spidey sense tells me there will be a trip there in my immediate future. TNNA (The National Needle Arts Association) is requesting feedback from knitters and other fiber artists. Please complete the 2010 Needle Arts Survey at www.NeedleArts2010.net. Whether you are a beginner or an expert, they need your input! This survey is only conducted every few years, and the findings will be published in a national report. You also have a chance to win one of five $100 needle arts gift certificates. Please check out my sister's new blog, Adventures of a Mischief Maker. She is highly entertaining! Oh your knitting is beautiful, I would never be able to spot an error:) It all looks perfect to me! Enjoy your knitting, I bet you are getting it out now to catch up! Have a blessed evening! It seems like the whole knitting community has been too busy to knit lately, but I think I'm finally over the hump. All it took was an exciting project to get me back in the saddle! Fiber artist...I like that ! Your knits are looking beautiful! Thanks for the survey link -- I did it -- it was pretty quick and painless! Love the colors of the 'Lacy' one, and it looks wonderful to me..hope you figure out your 'lifeline' wouldn't want anything bad to happen :) Don't know what that is exactly in knitty language. Enjoy your gift card at you LYS, I'll look forward to seeing what you find. I know what you mean... I'm itching to get back to my sewing machine, but every time I sit down to it I sigh and turn it off again. Must be spring fever (of some kind). I'm off to check out your sister's blog. Have a great long weekend! Hope you'll get around to finish your Ishbel - love the colour and can't ait to see it done :) I'm thinking of knitting on in white. Hi Stacy Dear Friend~Thanks for all the great knitting info. I will check it all out. You are so talented with your knitting. Don't worry about mistakes they are part of the pattern is what I tell myself. They also give the project a "homey" look. I think that everybody has that not been knitting vibe and just trying to get back into the fiber vibe. I don't know what it is, maybe a turn in the weather. or something.